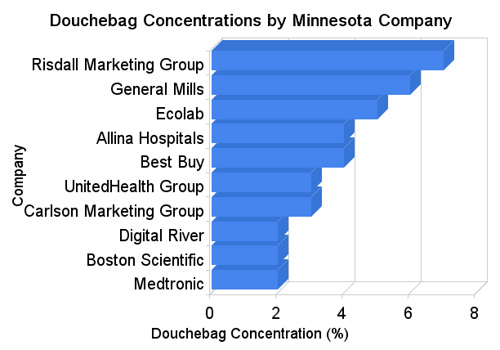 Which MN Company Has the Highest Douchebag Concentration? LinkedIn has a Key Statistics along the right column of their business profile pages where they show which schools a company’s employees attended. I suppose this information could be used to get a feel for what type of people work for a given company. Whether that really happens, I don’t know. So, based on that definition, a review of LinkedIn’s business profiles of Minnesota based companies employing CSoM grads should give us a good read on which companies are most douchebag heavy. Risdall Marketing Group is currently the most douchebaggy Minnesota based company by this metric, using Urban Dictionary’s definition. Stats don’t lie, right? At this point, it appears that Risdall is just piling on, with another Carlson School of Management hire announced this week. I think this just might be my favoritest The Deets post ever. Kudos. how in gods name could you forget Target? Have you ever walked through the skyways dt? Those people are serious DBs!!! Kate, I checked Target. While there are certainly many douchebag Targetrons, they’re diluted by the non-CSoMs. douchebags, but successful douchebags. hmmm. If you were able to isolate the Target HQ folks from the Retail folks, they would be off your chart. If the definition is “A student or instructor,” then by definition, aren’t graduates post-douchebags? In other words, by definition, graduates are no longer douchebags. This kinda ruins the point of the post, no? And yes, by definition, I am a douchebag. I’m a sucker for anything with douchebag in the title. Some solid research here Ed. As always. Good point Ed, but I bet 50% of those non CSoMers are Frat boys or Sorority girls that majored in politics or psych… I promise they’re still stellar Dbags. Outstanding research. Was there a metric for douchenozzles? Hahaha people who get a graduate education are douchebags! I think we should keep our focus on the real source of local douchebaggery – the 6th congressional district. All right! I hit the perfecta! I’m a CSoM grad AND I work at Target! No regrets with either, despite Ed’s, um, ISSUES with both. As a graduate of the Humphrey Institute, douchebags are my sworn enemies. However, I’ve often wondered if Carlson students/faculty/grads are even aware of this Humphrey/Carlson feud. As part of the Target Hive Mind, I agree that HQ is sorely underrepresented in your survey. I want a dollar every time someone says “opportunity” instead of “problem”. Little Red, I’ve run the numbers on that and should have a post up sometime soon.